Dosetai of Kefar-Yatma, a pupil of Shammai ('Orlah ii. 5). Dosetai b. Matun, a tannaite mentioned in a Baraita (Ber. 7b; Meg. 6b) as the author of a haggadic sentence, which in another place (Derek Ereẓ, ii.) is ascribed to Dosetai b. Judah. According to Yoma 30b, an amora, Dosetai b. Matun, handed down a sentence of Johanan's; but the correct reading is "Justai b. Matun," which is found in the parallel passage, Zeb. 99a, and is confirmed by the Jerusalem Talmud (Yer. B. K. vii. 6a). On Abba Jose b. Dosetai see Bacher, "Ag. Tan." ii. 388. Dosetai, the father of Apotriḳi or Patriḳi. (Ḥul. 64b; compare B. M. 5a). He is perhaps the same Patriḳi or Patriḳ who is mentioned as the brother of Derosa (Yer. Yoma iv. 41d). Dosetai the Elder (Yer. Ned. x. 42b; Yer. Hag. i. 76d), mentioned with a younger Dosetai. 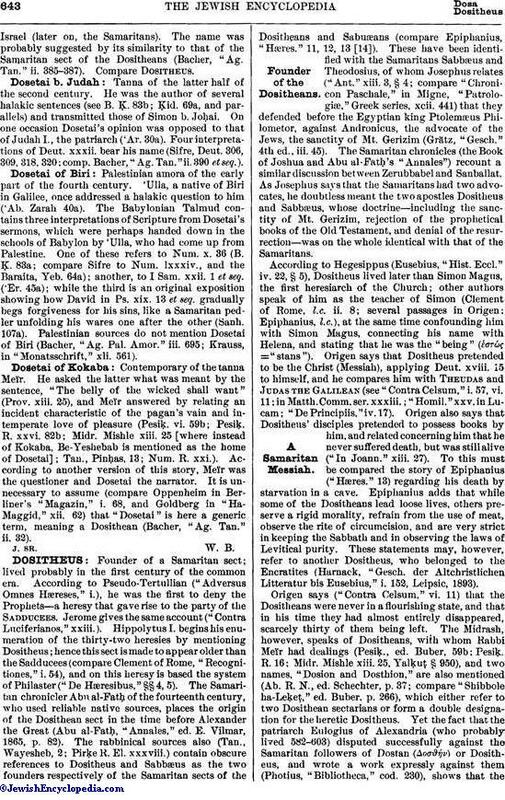 He is probably the Dosetai frequently referred to in Midrashic literature as having handed down the sentences of Samuel b. Naḥman and of Levi (Bacher, "Ag. Pal. Amor." i. 488, 492, 503; ii. 431; iii. 695). Tanna of the latter half of the second century, known especially as having handed down sentences of the tannaim Meïr, Jose b. Ḥalafta, and Eleazar b. Shammu'a. On a journey to Babylon he was ill-treated at Nehardea by the Jewish-Persian authorities, and took revenge by giving a satirical description of the latter. The account of the affair is preserved in two different versions (Giṭ. 14a, b; Yer. Giṭ. i. 43d; Yer. Ḳid. iii. 64a). Examples of Dosetai's humor are to be found in his answers to his pupils' questions on the differences between man and woman (Niddah 31b), and in his reply to the question why Jerusalem did not have thermæ like Tiberias: "If Jerusalem had warm springs," he answered, "the pilgrims coming up for the feasts would have dwelt on the pleasures of the baths offered them, instead of considering how best to fulfil the regulations for the pilgrimage" (Pes. 8b). The words of Eccl. xi. 6 ("In the morning sow thy seed," etc.) he explained as a reminder to the farmer to be diligent in his sowing and planting (Ab. R. N. iii.). In another sentence (ib. xi.) he showed how the person who does not work during the six week-days will soon find himself compelled to work on the Sabbath. One of Dosetai's sermons praises almsgiving, interpreting Ps. xvii. 15 thus: "Through charity shall I see thy face, and enjoy thy sight on awakening" (B. B. 10a). In a later Midrashic legend (Tan., Wayesheb, 2; Pirḳe R. El. xxxviii.) Dosetai b. Jannai is the name of one of the two teachers sent by the Assyrian king to convert the pagans who had settled inIsrael (later on, the Samaritans). The name was probably suggested by its similarity to that of the Samaritan sect of the Dositheans (Bacher, "Ag. Tan." ii. 385-387). Compare Dositheus. Tanna of the latter half of the second century. He was the author of several halakic sentences (see B. Ḳ. 83b; Ḳid. 69a, and parallels) and transmitted those of Simon b. Joḥai. On one occasion Dosetai's opinion was opposed to that of Judah I., the patriarch ('Ar. 30a). Four interpretations of Deut. xxxii. bear his name (Sifre, Deut. 306, 309, 318, 320; comp. Bacher, "Ag. Tan."ii. 390 et seq.). Palestinian amora of the early part of the fourth century. 'Ulla, a native of Biri in Galilee, once addressed a halakic question to him ('Ab. Zarah 40a). 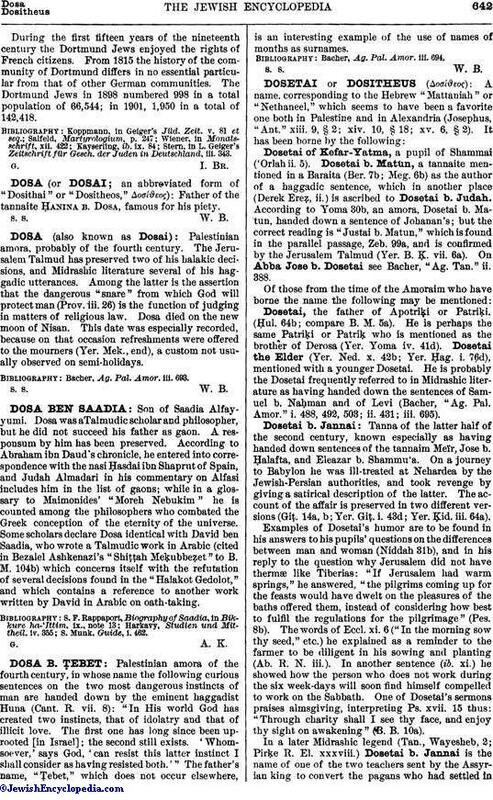 The Babylonian Talmud contains three interpretations of Scripture from Dosetai's sermons, which were perhaps handed down in the schools of Babylon by 'Ulla, who had come up from Palestine. One of these refers to Num. x. 36 (B. Ḳ. 83a; compare Sifre to Num. lxxxiv., and the Baraita, Yeb. 64a); another, to I Sam. xxii. 1 et seq. ('Er. 45a);, while the third is an original exposition showing how David in Ps. xix. 13 et seq. gradually begs forgiveness for his sins, like a Samaritan pedler unfolding his wares one after the other (Sanh. 107a). Palestinian sources do not mention Dosetai of Biri (Bacher, "Ag. Pal. Amor." iii. 695; Krauss, in "Monatsschrift," xli. 561). Contemporary of the tanna Meïr. He asked the latter what was meant by the sentence, "The belly of the wicked shall want" (Prov. xiii. 25), and Meïr answered by relating an incident characteristic of the pagan's vain and intemperate love of pleasure (Pesiḳ. vi. 59b; Pesiḳ. R. xxvi. 82b; Midr. Mishle xiii. 25 [where instead of Kokaba, Be-Yeshebab is mentioned as the home of Dosetai]; Tan., Pinḥas, 13; Num. R. xxi.). According to another version of this story, Meïr was the questioner and Dosetai the narrator. It is unnecessary to assume (compare Oppenheim in Berliner's '"Magazin," i. 68, and Goldberg in "Ha-Maggid," xii. 62) that "Dosetai" is here a generic term, meaning a Dosithean (Bacher, "Ag. Tan." ii. 32).